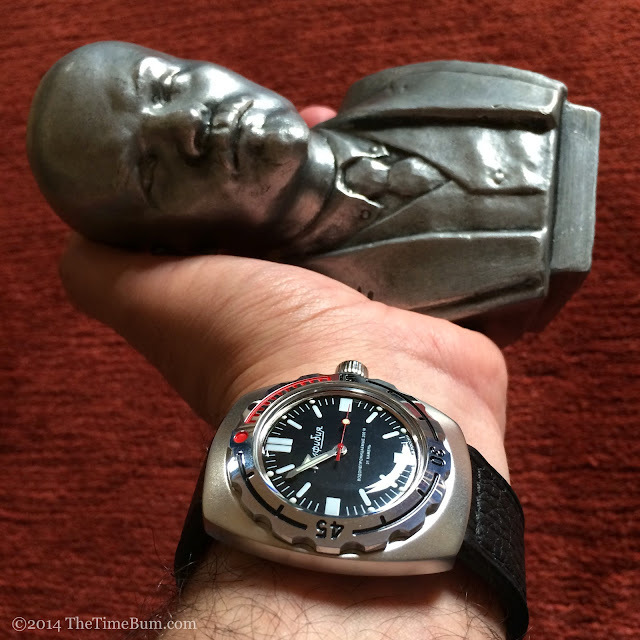 My affinity for Vostok Amphibias has been well documented in these virtual pages. They are tough watches, with ingenious engineering, 200 meters water resistance, an in-house automatic movement, and an interesting history. Best of all, they are dirt cheap. Really, all a Time Bum could possibly wish. I have owned a couple of the mid-sized, round 420 case models. At 40mm with small dials and 18mm straps, they tend to wear small, which is not a bad thing when you are slight of build, but I do enjoy a larger watch every now and then. Dive watches in particular lend themselves to a more muscular look, so when I saw the beefy 090 case Amphibia on ChistopolCity.com for a mere $56.27, I grabbed one. The Vostok Auto Amphibia 1967 Design, as it is dubbed on the site, has a 41x48mm lugless tonneau case like the original did, 47 years ago. A 1mm difference between the 420 and 090 may sound insignificant, but a square occupies much more space than a circle, resulting in one nice fat chunk of stainless steel. The top surface is curved, sloping away towards the edges, which also arc from one corner to the next, creating a cushion shape. The case back is engraved with the stylized Amphibia script and like others in the series, it is a bayonet mount against a fat gasket that actually increases its resistance when compressed by water pressure at depth. The dial and bezel are the same size as every other Amphibia variant, leaving a broad expanse of matte finished metal in view. The crystal is domed acrylic, lending a perfect vintage feel and contributing to the water resistance by compressing under pressure like the case back. Overall thickness, from case back to dome, is 15mm. This mighty case houses the 31 jewel 2415, anti-shock automatic movement, designed and built by Vostok. It has hand winding capability, but I found it difficult to find the right position to do so without engaging the threads on the screw down crown. A couple of gentle shakes got it rolling just fine. Power reserve is 33 hours. The large crown is easy to grasp because of its size, but its shallow coin edging offers little assistance. Timekeeping was a bit off out of the box, running a full 30 seconds slow. After day of use, I noticed it running faster, first -25 seconds, then -20. After three days it was running about -10 seconds. This is pretty common with Vostoks. The seem to benefit from a few cycles before they settle in to the -10 to +30 range of accuracy. The polished bezel pops nicely against the dull surface below it. I like a combination of finishes on a watch, but I would have preferred radial brushing on the case instead of the existing textured satin finish. The bezel action is tighter than some Amphibias I have handled, but like the others it does not ratchet, and is not unidirectional, limiting its utility for actual diving. On the other hand, it looks much better than the others. 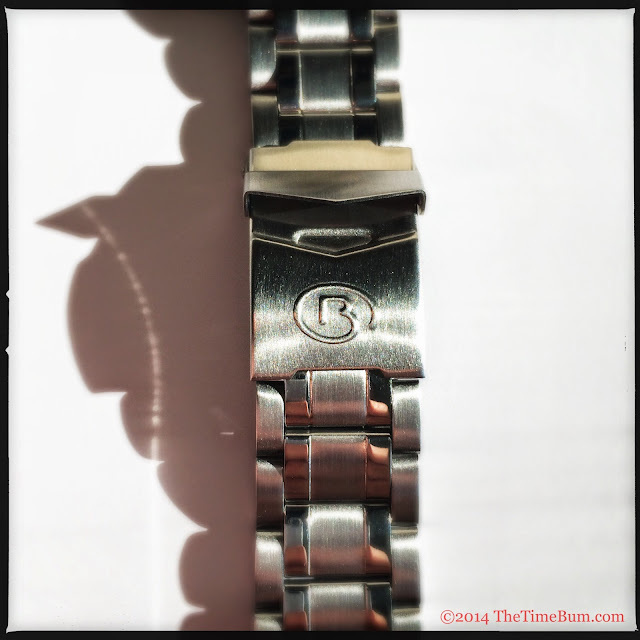 It has grippy, scalloped edge, and a far more useful index, although the engraving is on the thick side, making precision timing a bit iffy as you reach the red quadrant. The dial is that of a traditional white on black dive watch - no frogman, just bar markers with thicker ones on the quarter hours and a double bar at 12 o'clock. The hands are the same arrows found on other modern Amphibias, not the paddle hands of the original 1967 model and the reissue. A red second hand with a lume dot provides a welcome spot of color. All text on the dial is in written in the Cyrillic alphabet: the Amphibia name in script at the top of the dial, "water resistant 200m" "31 jewels" below. There is no date, and on an Amphibia, this is a good thing as the movement lacks a proper quick set. On my other Vostoks, I wind the hands from 8 o'clock to 12 o'clock and back to advance the wheel. 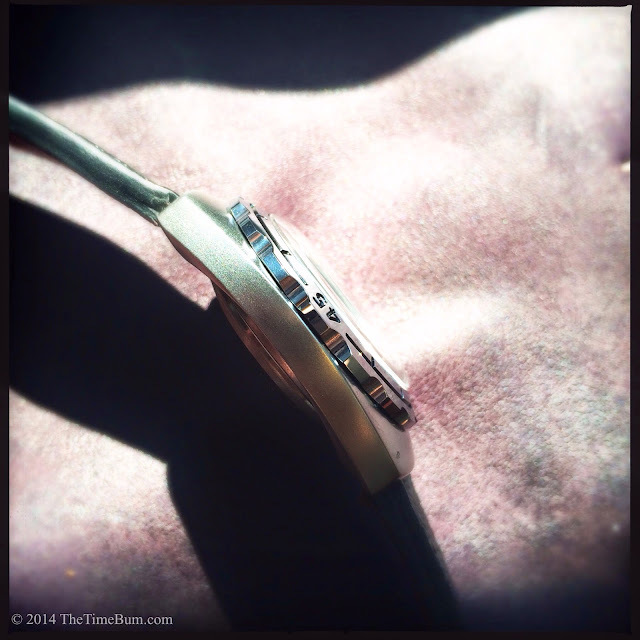 It is a colossal pain if you have not worn the watch for a few weeks, which is often the case with me. In general, I prefer the look of a dial without a date window, but it is a particular blessing here. Like other Vostoks, it has been painted with lume, but you would never know it. The glow is dim at best and fades immediately. The high contrast markings provide some basic readability in low light, but this is not a watch for nocturnal types. Crepuscular maybe, but not nocturnal. It comes on a 22mm stainless steel bracelet, with links brushed on the sides and polished in the center, secured by a signed, locking diver's clasp. It looks good on the watch, but I found the catch on the clasp to be unduly stiff and hard to operate, with worryingly sharp edges. The links are lightweight and bracelet produces a tinny rattle when moved. If you really want the look, I would suggest buying one aftermarket. 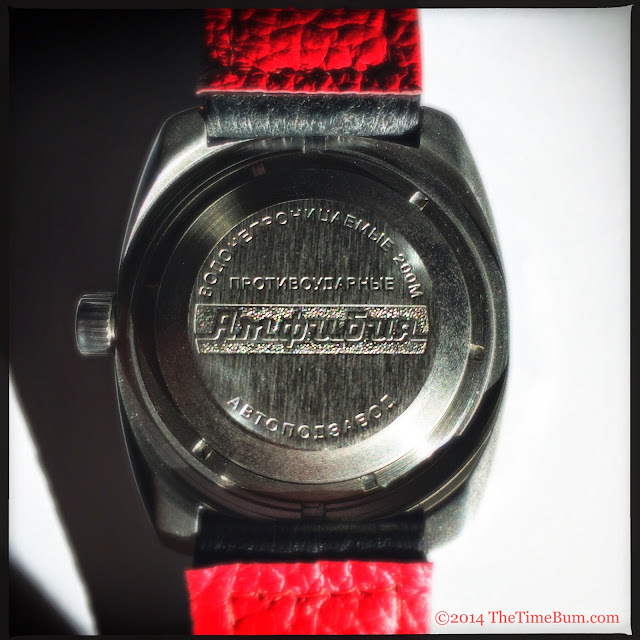 I replaced the bracelet with a black 24mm Magrette strap in thick, soft leather that squeezed into the narrower lugs. It is a perfect strap for the 090 case watch, and the red backing coordinates well with the red second hand and warning zone on the bezel. If I recall, the strap cost nearly as much as the watch itself. 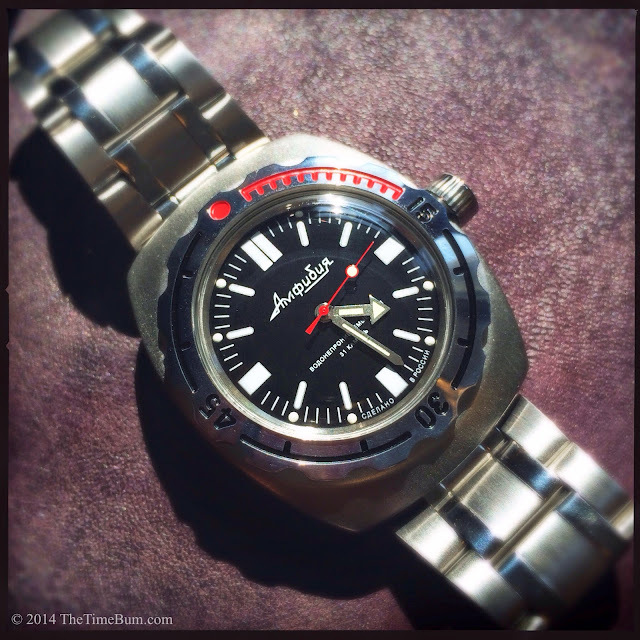 As I have said before, Vostok Amphibias are one of the great bargains of the watch world. For the price of a Timex at Target, they offer a legitimate 200m automatic dive watch. It looks cool, and it is highly unlikely that two will show up at the same party. The 090 case models expand the already diverse Amphibia range. Panerai style 12/3/6/9 dials are also available, as are polished cases, different colors, and yes, even a version with the familiar frogman. If you are curious about these Russian timepieces, but have been put off by their relatively modest dimensions, then the 090 case is just what you have been waiting for. 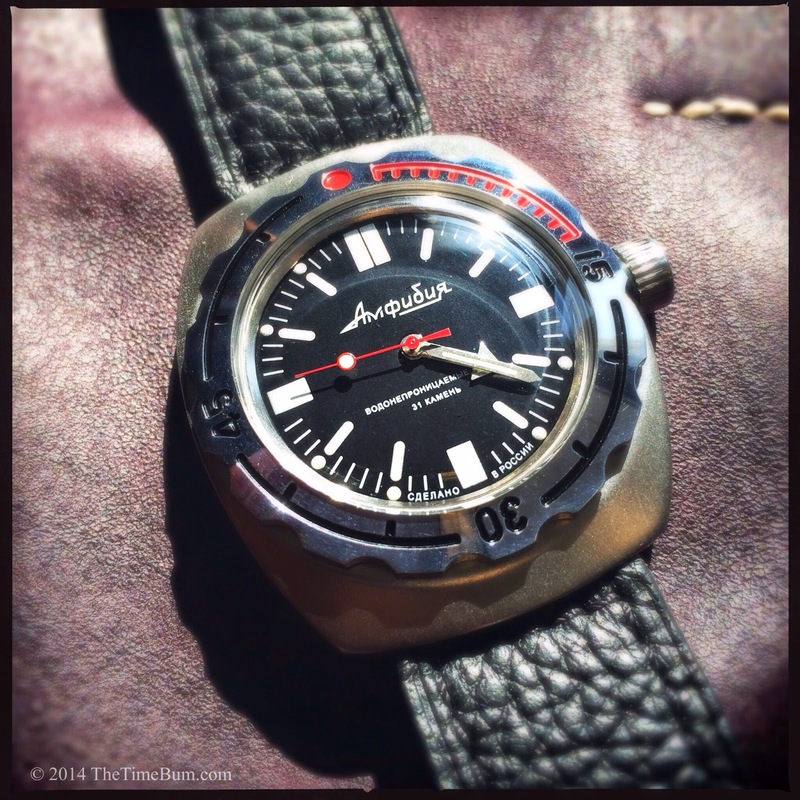 Pro: The usual Vostok goodness with no date and a big case. 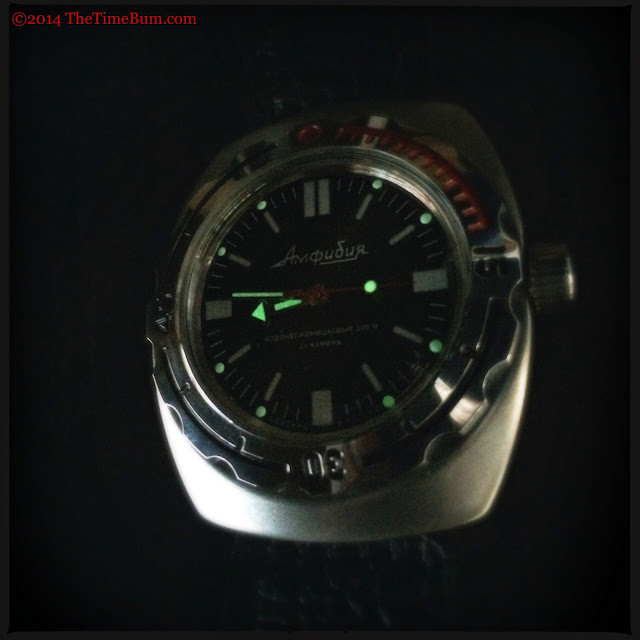 Con: The usual Vostok anemic lume and dodgy bracelet. Sum: Bigger, better, and still under $60. The Time Bum Approves.